Out of Italian seasoning? Don't sweat it. You probably have everything you need to whip up a batch. After all, it's nothing more than a blend of common herbs. In fact, once you see how easy it is to put together (we're talking five minutes tops), you probably won't ever buy it again. Homemade Italian seasoning is fresher and more flavorful than anything you can buy at the store, and it happens to be cheaper, too. Ready to give it a try? Here's the recipe. Once you're satisfied with the consistency, you're all set! Use your Italian seasoning immediately, or store it in an air-tight container until you need it. Just be sure to label the container, so you don't mix it up with another spice blend. This recipe makes 10 tablespoons (just under 2/3 cup) of Italian seasoning as written, but it's easily scaled. Just maintain the ratio in the recipe, and you can make as much or as little as you need. To maintain freshness, aim to make no more than you can use in six months. 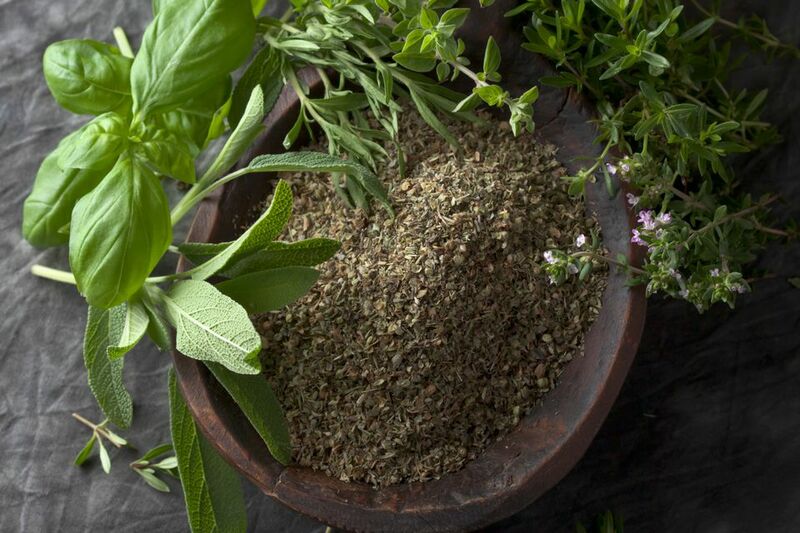 This recipe makes a traditional Italian seasoning blend, consisting of just herbs. But there are gourmet versions on the market that include things like, crushed red pepper, garlic powder, onion powder and/or ground black pepper. Experiment with the recipe, until you land on something that suits your tastes and needs. One of the benefits of making your own spice blends is the ability to make them your own. When you get it just right, be sure to write down the recipe, so you can make it again and again. Out of one of the herbs called for in the recipe? Just leave it out. Your Italian seasoning will still taste great without it. Make a big batch of Italian seasoning, and divide it up into smaller jars for gift giving (half pint or quarter pint jars would be perfect). Include a label with the recipe, so your friends and family can make more when they run out. To save money, buy your dried herbs from the bulk bins at your grocery, or make your Italian seasoning with herbs from your own garden. All of the necessary herbs are easy to grow and just as easy to dry. A good number of them are even perennials. Plant them once; then, harvest and dry your herbs each year while they're in season, so you always have plenty of herbs on hand. New to drying herbs? Pick your herbs early in the morning (when they're most flavorful). Then, secure a bundle with a rubber band and hang them upside down in a warm, dry place to dry. When your herbs feel dry and crinkly to the touch, they're ready to use. If you want to dry your herbs faster, you can also dry them in a dehydrator or a very-low temp oven. Use your homemade Italian seasoning to make your own Italian dressing. It'll be healthier and more flavorful than a bottle of store-bought dressing (or one of those preservative-laden Italian dressing packets). In a jar, mix 1-1/2 Tablespoons of Italian seasoning with 1/4 cup vinegar (white, apple cider or white wine) and 1/2 cup of a mild tasting oil (canola, salad, etc.). Secure the lid. Then, give the jar a good shake to combine the ingredients, and enjoy. Your homemade salad dressing should keep for several weeks in the refrigerator, so it's just as convenient as the store-bought stuff. As you run out of your favorite spice blends, give these homemade versions a try. They’re sure to become your new favorites, and they may even help you clear some space in your pantry.